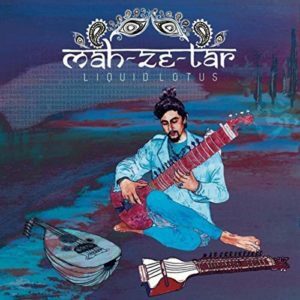 We glisten right into the mystical jangle of a single-string instrumental in “Maand,” the first track of Mah-Ze-Tar’s Liquid Lotus. On these 9 tracks, all based on a specific Indian Raga, we get a mix of traditional Indian sounds with newer technologies, as well as Maz singing in Hindi, Farsi, and English while bringing in vocal textures based on syllables of the ancient Indian Dhrupad tradition. It all makes for a wild concoction of sounds and vibes to be sure. “Bhoopali” follows, the first vocal tune, an undulant concoction of peaceful sweeps, the vocals following the single shimmering string melody, all kind of mixed into a syrup that you can float over the top of, while “Liquid Lotus,” with its washes and flips of strings behind the wonderful mournful vocals, open up into the first song with a real beat, and with the English lyrics it is the obvious single. “Yaman” brings us back to that single string playing of “Maand,” but here we have some snapping in the background and Mah truly offering up a haunting vocal, like the track that follows, “Keshi,” (with its flute like melody). Both might be a little hard for Western ears to catch on to, but the drum machine back beat of “Yama,” and the slow piano plodding of “Keshi,” tickles into familiar sonic territory. Plus Mah’s voice is really magical on both. The last tune “Bilawal” sees a spoken voice-over explaining (in English) how to play this music, quite a cool way to end. And Mah-Ze-Tar wails to end the tune.